High speed Intranet and Internet access, VNO, closed usergroup, VPN, VoIP, VSAT-Monitoring, QOS and HUB-Managing. Nynex has established a wideranged network including a large partner and reseller network all over Africa, Europe and MEA. The company currently provides teleport & satellite services with its own hub-infrastructure on 4 different teleports. They are located in Griesheim, Ottobrunn, Ruprichteroth (all Germany) and Burum (Netherlands). All teleports are manned 24/7 and have a redundant multi-backbone internet connection. The provided range of satellite services in the KU an C-Band range starts with enduser services for home-use up to trunking-solutions to offer speeds up to 150MB/s. Nynex is offering several vsat-monitoring tools (VNMS/NXMS/x3-web-interface) to give a maximum service-transparency to its customers. With these tools, clients can easily figure out answers about their data-usage, connection-stability and other remote-status. Nynex is permanently listed in the yearly released Com-Sys-Report. Nynex was founded in October 2000 by Andreas Buxbaum and Gunter Frank in Darmstadt, Germany. 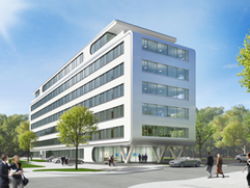 The NYNEX satellite OHG office is located in the newly developed Europaviertel of Darmstadt with a couple of important it- and space-companies in its neighborhood. Use a taxi (12 minutes to drive) from the airport directly to our office or use the Airliner Bus (15 minutes to drive – no stops in between) and leave it at Maritime Hotel. Continue with a 5 minutes walk by crossing Rheinstraße into Zweifalltorweg and turn left after the B6B hotel into Robert-Bosch-Straße. Leave the A5 at the exit GRIESHEIM/DARMSTADT direction Darmstadt center, follow the Rheinstraße until you pass the first bridge and turn right into Eiffelring direction STARKENBURG KASERNE. Follow Eiffelring for 500m (by crossing Rheinstraße) and turn right into Maria-Goeppert-Straße. After 250m turn left into Robert-Bosch-Straße. Our office is located at the nearly end on the right side.